Infinity Partnership has been recognised by an international organisation for its commitment to training and development. Infinity has been awarded platinum level approved employer status for Trainee Development by ACCA – an upgrade from its previous gold status. The latest accolade recognises Infinity’s continued high standards and commitment to the development of its team. The business had already been recognised by ACCA after successful gaining approved employer status for Practising Certificate Development, again for its support in the development of the team. Under strict guidelines, the certificate allows for greater in-house monitoring of trainees and ACCA (Association of Chartered Certified Accountants) members. 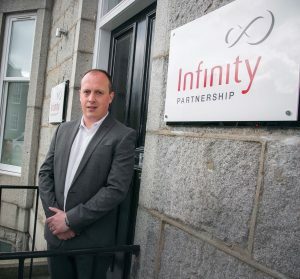 Greg Houston, client manager at Infinity, said: “We are delighted to have attained platinum status. It recognises our professional approach to processes and procedures for developing our team and our commitment to supporting them through exams and beyond. Greg is an active member of the ACCA Regional Panel in Aberdeen. He is also responsible for arranging for pupils and students to gain valuable work experience at Infinity’s West End office.